June 2015: PCS’ing with style. 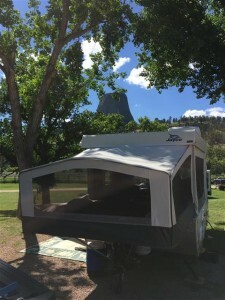 As noted in a prior post, a couple years ago Son #2 entered the RV community, following in the family tradition with a pop-up camper. Since then, he’s made several trips with his family and has even started his own blog: kazathon.com. It would be hard to duplicate that kind of a trip nowadays, but Robert is coming close. 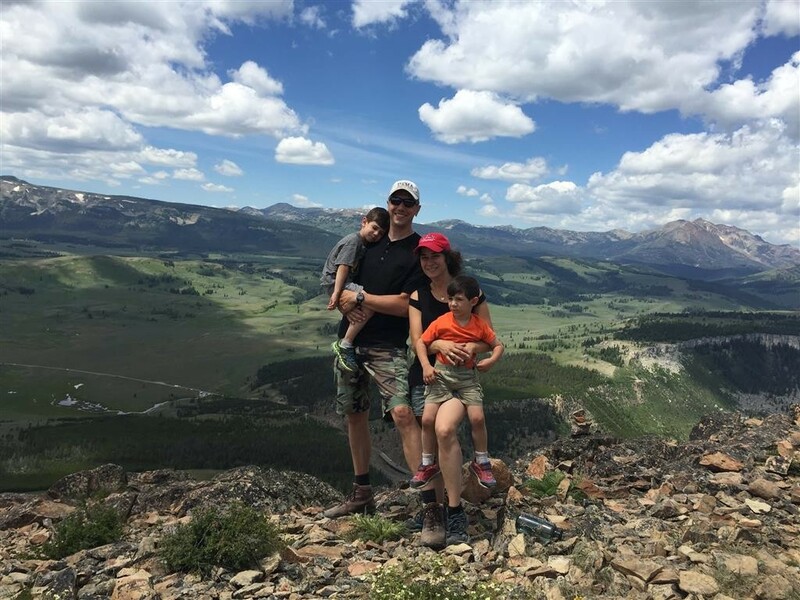 He finds himself moving from Leavenworth (Kansas) to Fort Lewis (near Tacoma, Washington), and in making that “permanent change of station,” he is taking the opportunity to camp cross-country in a rough northerner-and-shorter version of our 1988 trip. His PCS trip basically takes him from Leavenworth, to Badlands NP, Mt. Rushmore, Devil’s Tower, Little Bighorn, and then to Yellowstone for three days before making the final run to Washington. 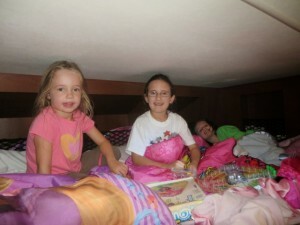 A few pictures of the trip are here. A military move is normally just a slow-motion catastrophe. In terms of one’s furnishings, the expression is “Four moves equals one house fire.” But leave it to these guys to take a dreaded PCS and convert it to something where “PCS” stands for “playing, camping, and sightseeing”! On edit: the trip is now concluded. As Robert said, “The plan didn’t survive the first contact.” Read about the trip here: http://kazathon.com/2015/07/05/our-2015-big-summer-trip/. This entry was posted in Uncategorized on June 28, 2015 by skiprd. OK, so this is apropos of not much, but here are a few interesting facts. ExxonMobil recently announced its 2013 earnings, reaching $32 billion on sales of $438 billion, or 7.4%. Admittedly, a 7.4% rate of return is pretty good (although not stunning–it’s a little better than I do on my 401(k)). So, is that why gasoline is so expensive? Because ExxonMobil (among others) is making a lot of money every time I buy a gallon of gas? As it turns out, no. The same post points out that ExxonMobil’s profits work out to about 5.5 cents for every gallon of gasoline it produces, transports, and sells. That’s a lot of work to earn 5.5 cents. So we could whack ExxonMobil’s profits entirely and save 5.5 cents on a gallon. Whoopdeedoo. But someone is making money on that gallon. I wonder who it could be. This map explains it. 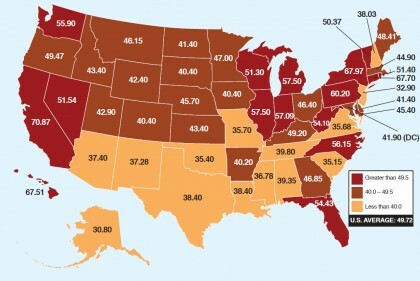 Gas taxes per gallon. More information is available here. So … every time I buy a gallon of gas, ExxonMobil makes 5.5 cents, the federal government makes 18.4 cents, and the State of Georgia makes over 28 cents. That makes the burden here in Georgia almost 49 cents/gallon. Maybe I’m lucky, though. It’s over 70 cents/gallon in California. Think about that when you’re pumping 80 gallons of gas into a motorhome that gets 7.5 mpg. I guess that means you can add me to the list of people who are hopping mad about gouging at the pump! This entry was posted in Uncategorized on August 28, 2014 by skiprd. 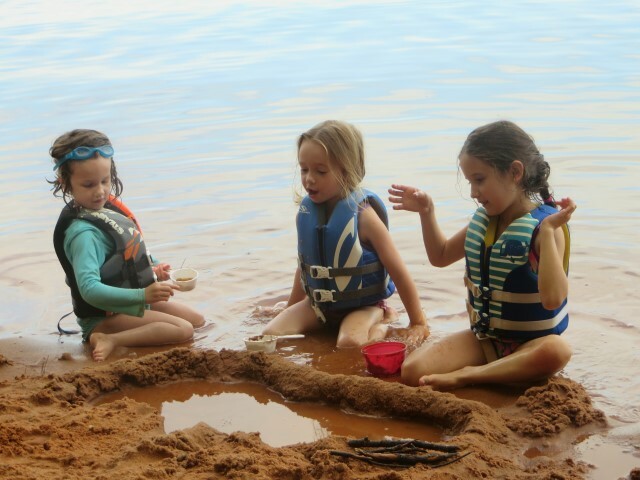 We’ve tried taking a grandchild along on a camping trip before, but only one. This time it was the Full Monty: three of ’em. Michelle (age 7) and Rachel (age 4) (daughters of our daughter, Jennifer) and Ansley (age 5) (daughter of our son, Cliff). 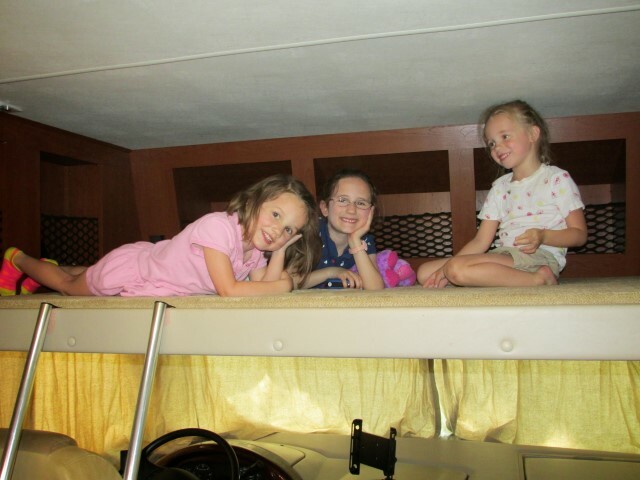 Admittedly, we had Jennifer and Cliff with us for the first night, and Cliff for the second, but still the question demanded an answer: what would happen with three little girls confined to a campground for 3 days? And the answer is now in: it’s wonderful! 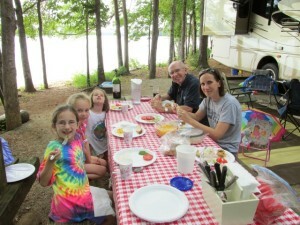 So, off we went to Holiday Campground, Site #79, on West Point Lake. We arrived Friday, just after lunch, after a L-O-N-G road trip of approximately 4 miles. OK, so we’re chicken. We wanted to be close enough that (1) we didn’t have to worry about how the kids would take to a long trip, and (2) we had an easy bail-out option if necessary. From that point on, the three girls basically entertained themselves, focusing on three kiddish endeavors: playing with dolls and reading up in their “secret fort” (AKA the overhead, drop-down bunk); playing on the “beach” (what some people might call the muddy shoreline); and playing in the water. Oh, and there were smatterings of eating, bike riding, and a few other miscellaneous activities thrown in. Mercifully, though, no TV. And I have no idea what this is. All things considered, I’d say the trip was a great success. Of course, we’re still a ways away (like maybe 4 years?) from doing a trip like this unchaperoned, but with just a little help, this is a great way to spend a weekend and we’re ready for another one! This entry was posted in Uncategorized on June 10, 2014 by skiprd. 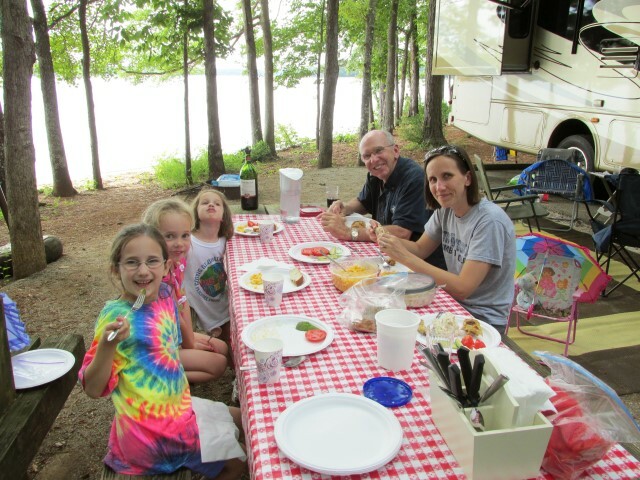 OK, so this really isn’t a post about our experiences in our motorhome, but it’s related. In the 1980s and 1990s, we spent a lot of time camping with the kids in our Coleman pop-up camper, including an incredible 2-month trip around the country. (My wife and her dad did the driving, I flew out and met them for Grand Tetons and Yellowstone.) 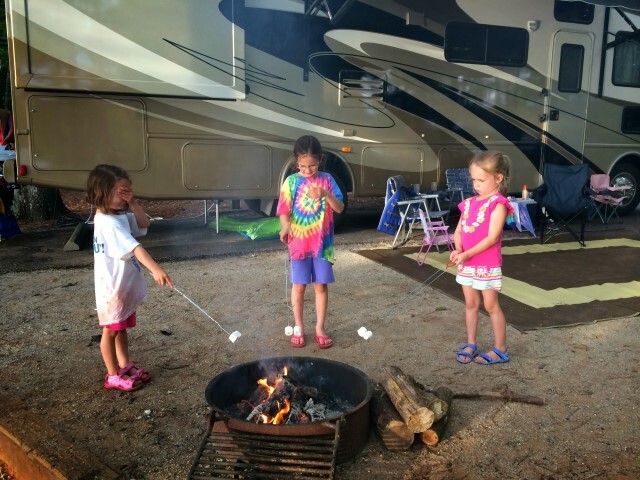 Our family getaways were usually nothing more than a quick drive up to the local Corps campgrounds at Lake Lanier, and our big vacation every year was a Thanksgiving trip to the Fort Wilderness campground at Disney World. Twice there have been circumstances where my belief about the quality of those experiences have been validated. The first is when my older son, about to be deployed to Iraq, said that the one thing he really wanted to do before he left was to go camping with the family. 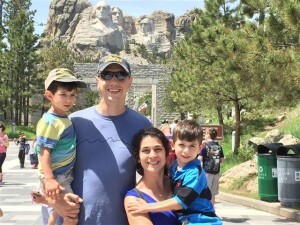 The second occurred just a few weeks ago when my younger son said he and his wife had decided to buy a pop-up so that their family (two young boys) could have the same experiences. Unfortunately, he’s stationed out in California, so he asked if we could check around and see if there were any nice units within his price range near us. 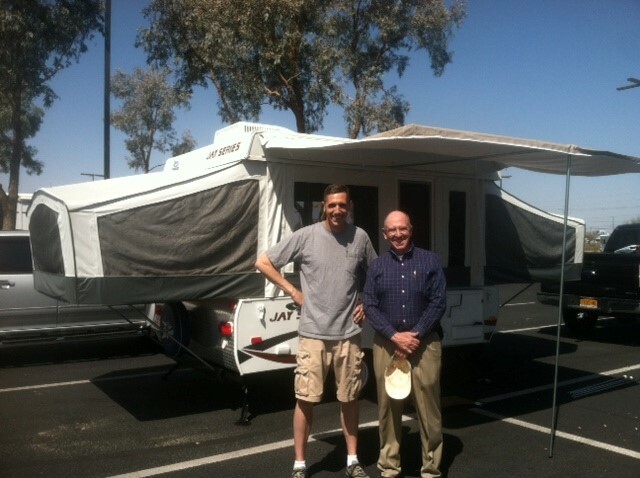 We found one, a brand-new 2012 Jayco Model 1007 pop-up. Perfect for a young family and within the price range. 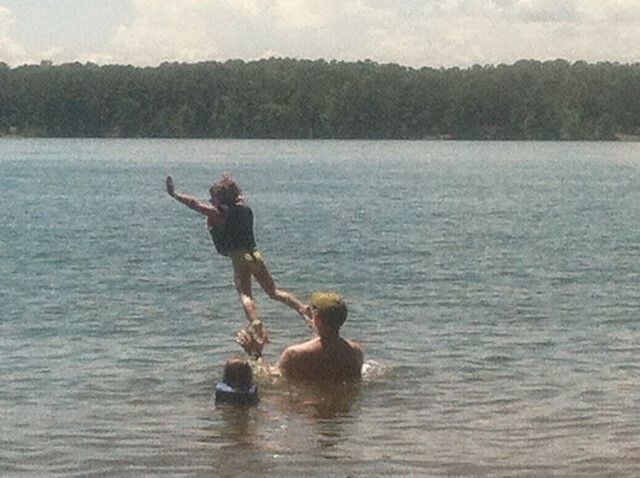 The problem, of course, is the unit is here in Atlanta and he’s 2100 miles away. The solution? I’d take a couple days off of work, the DW and I would hook up the camper and head west, he’d leave on a weekend as soon as he could and head east, and we’d meet in Tucson. The result for us was a 5-day, 3500 mile road trip. What a great experience! 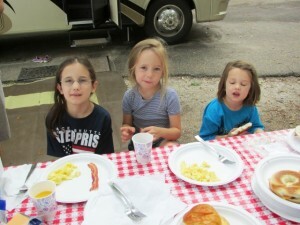 And the best part is that we now have a new generation launched on the camping lifestyle. This entry was posted in Uncategorized on March 26, 2013 by skiprd. It’s 620 miles from LaGrange to Indianapolis, so we decided to break the trip into two days. So last night we loaded up Ace, parked it in front of our driveway, ready for an early morning get-away. At 0745, we hit the road–our first real trip in our Thor ACE 30.1. Next stop: the KOA in Bowling Green, KY. The trip proved interesting in several ways. First, ACE is a dream to drive. Maybe I was born for this life, but time and the miles just fly by. 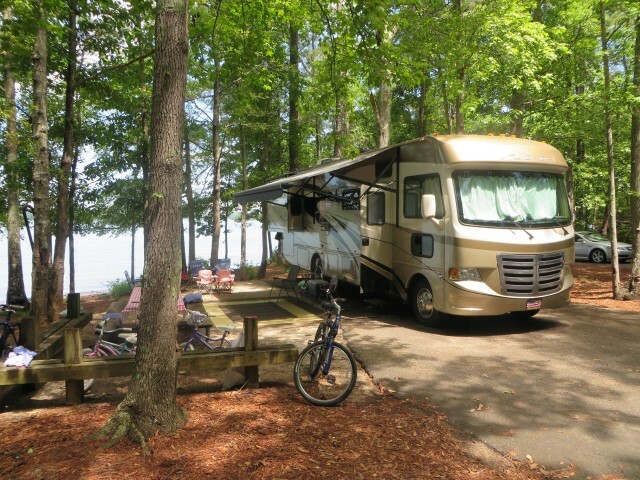 Much of the early part of the trip was spent off the interstates (US-431 to I-20, and then AL-77 up to I-59), and driving along those kinds of roads in a motorhome like Ace is near-perfect. I was reading one of Chuck Woodbury’s posts on RVtravel.com and he noted that he only travels by back roads. He’s definitely onto something. Second, unfortunately, there is a well-known problem with the slide in the ACE models that causes it to squeak and rattle as one drives along. Well, we’ve got in spades. It’s not too bad on smooth roads, but when the road turns bumpy, it’s definitely PDA (pretty darn annoying). Even worse, the squeattle (squeak + rattle) is right over the driver’s head, which causes drivers of certain personality tendencies to get, um, “crabby.” It really was only bad on bad roads, which roughly means it was really only bad in Alabama. Which brings me to the third observation: what is going on with America’s road system? I guess I’ve been spoiled by living in Georgia, where the roads (except for urban area hell zones) are in terrific shape. But Alabama was another story: long stretches of both I-20 and I-59 that were “under construction,” except that given the lack of visible work they didn’t appear to be “under” anything and given the terrible quality of the roads after completion, I’d be hesitant to call the process “construction.” I’m reminded of someone’s description of “another road damaged by improvements,” except these roads are damaged by being built: concrete segments with poor alignment, leading to constant, rhythmic jolts. Very annoying. Which then leads to some random musings as I drive: Let’s see – 18.4 cents per gallon federal tax that goes into the Highway Trust Fund, plus (say) 22 cents per gallon in state taxes that are supposed to go into highway construction, means 40 cents per gallon, divided by 8 miles per gallon, equals 5 cents per mile … oh, never mind. But we were soon out of Alabama, into Georgia briefly, and then into Tennessee, where the roads were fine and the scenery beautiful. We stopped at Nickajack Lake for lunch, and then ACE did a masterful job going up to and down from Monteagle (our first test of hill climbing and descending). 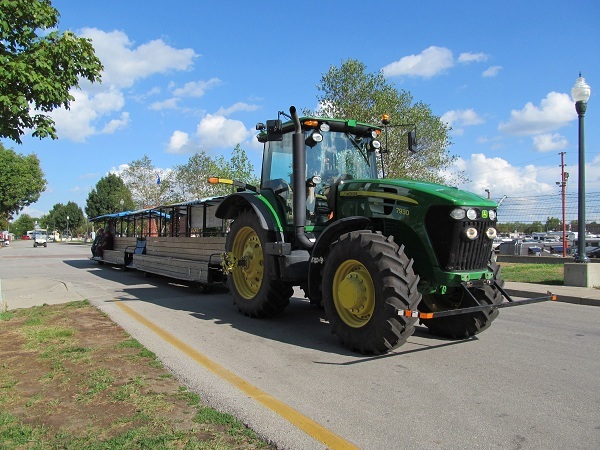 Through the “Nashville Nightmare” with no problems (we take Briley Parkway to skirt around Nashville proper) and then into Kentucky and Bowling Green, where we quickly set up at the KOA in Bowling Green (click here for review). Bottom line: 380 miles, averaging 8.19 miles per gallon (an inflated number induced by slow driving on back roads and construction zones–we’ll see what the real number is tomorrow). To understand what I’m about to say, keep in mind where I’m coming from. Ex-hippies, backpacking on our honeymoon, graduating to a tent, then a Vanagon camper, and then a pop-up when we had kids. Eventually, we upgraded to a travel trailer, but even still, almost always stayed in Corps, National Forest, and National Park campgrounds. 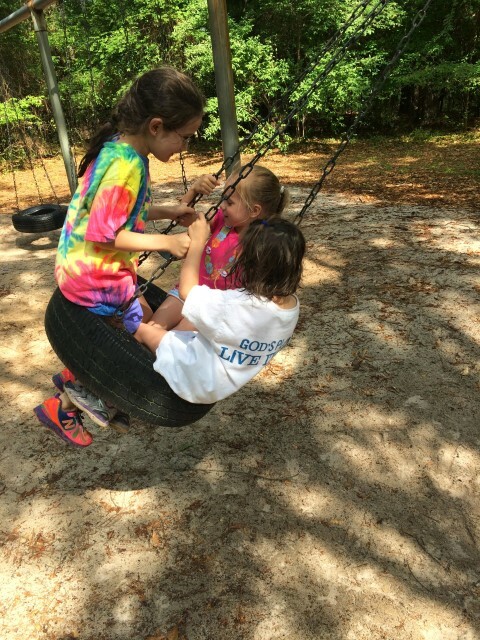 We once stayed at Topsail Hill State Park in Florida, which is like an “RV resort,” but quickly decided that, while the park was fine and we’d go back again, it was a little too uppity for us. Too many motorhomes that obviously never really got near anything near “camping.” I guess that’s maybe a little reverse snobbery? 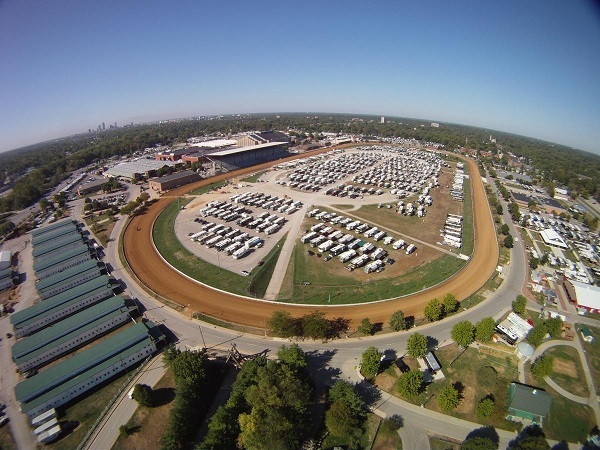 2500 motorhomes, 8000 people. Is this fun and different and something I’d like to do again? Or is it the third of the seven circles of hell? I’m not sure yet. Tomorrow we’re off to seminars, vendors, and new motorhome displays. Further information will follow. Today: 237 miles, 9.02 mgp. At my last post, I was wondering whether a thing like an FMCA Convention would be interesting and fun, or something that was akin to an unanesthetized tooth extraction. The answer is that, well, it’s complicated. We did lots of seminars, and they were very valuable. 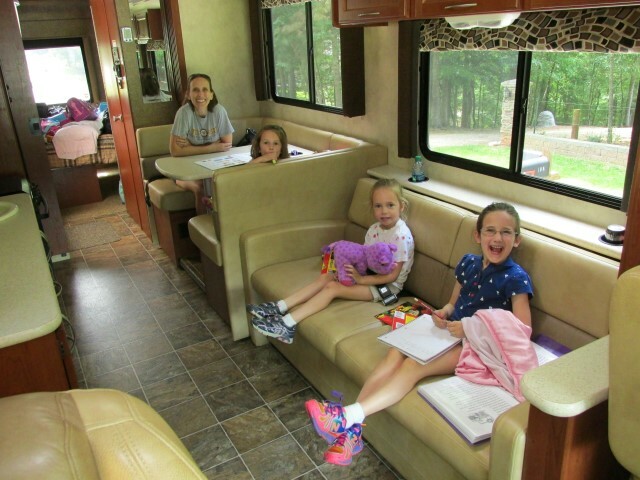 In fact, they were mostly exactly what we were looking for: a quick way to get up to speed on the many aspects of motorhoming that are completely new to us. We spent most of our time (6 hours total) in the RV safe driving course by RV Safety and Education Foundation. This was all classroom study (not on-road driving), but unbelievably valuable. We also attended seminars on how to tow a toad; use, maintain, and trouble-shoot generators; and understanding weight and tire safety. 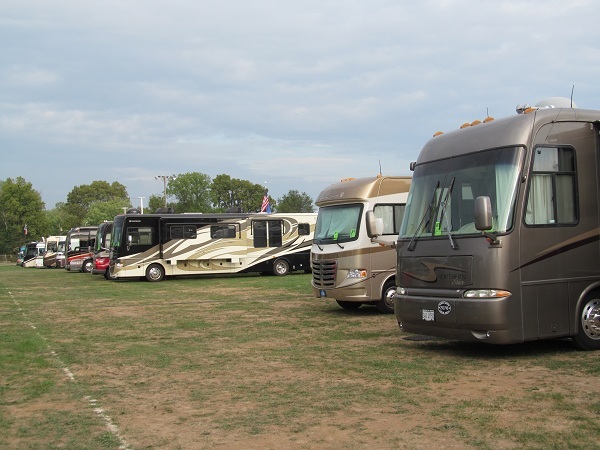 We toured the newest models of numerous lines of motorhomes. Frankly, most of them were pretty much over-the-top. The good news, though, is that we did NOT experience the dreaded consequence of going shopping after a making a purchase: finding something better. To the contrary, after touring literally dozens of motorhomes, we concluded there really isn’t anything out there that would be better for us than our ACE 30.1. Whew! We also spend lots of time (and money) in the vendor area, purchasing: a Blue Ox “Alpha”-model towbar and SMI “Duo”-model braking system (both for our toad, when we get one), a 6-foot foldable ladder, and most important to me, a TireMinder tire pressure monitoring system. We’ve already gotten the TPMS installed and I’m looking forward to seeing how it works on the way home. The purchases of the toad-related products revealed one very good reason to attend a convention such as this. We literally spent hours going from booth to booth (Roadmaster, Demco, BlueOx) getting information about each system, the seller’s views as to its advantages in comparison to the competition, the costs including all accessories, options, and so on. It would be difficult to duplicate that process elsewhere. There is also a social aspect to the whole gathering, although we didn’t really get immersed in that to the extent we could have. We did strike up a conversation with our neighbors, Jim (W8MQ) and Alice (N8IKA), and met other attendees as we wandered around, all of whom seemed very nice. Otherwise, though, we were pretty booked during the day, and we were completely foreclosed from being able to sit outside under the awning, review our literature, and strike up conversations with passers-by because of being parked within a few feet of a 100 kW generator, the roar and fumes of which pretty much rendered the area outside our coach uninhabitable. 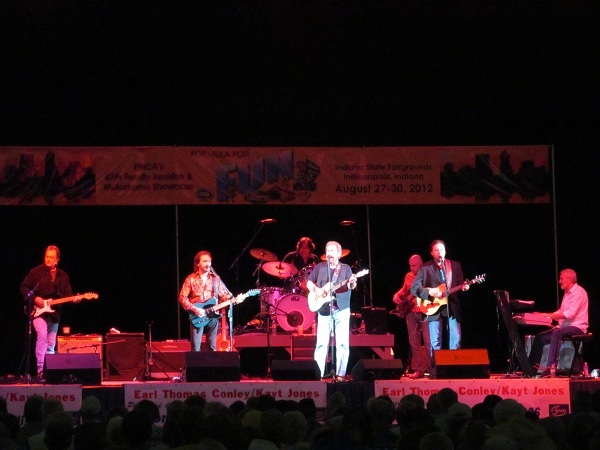 Oh, and we went (at least for a while), to the Earl Thomas Conley concert. No kidding. Finally, on the way out, we took advantage of the RVSEF offering to get Ace weighed at each wheel position. 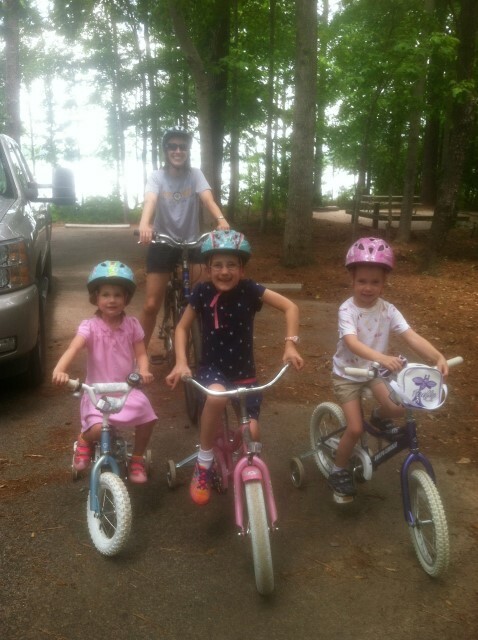 The verdict: we are way under maximum weights at each wheel position. The minimum inflation pressure for our Goodyear G670 RV tires is 80 psi. The label inside the coach indicates 82 psi. We had the coach weighed at the local Pilot truck stock, did a bunch of upward adjustments for traveling loads, and concluded 80 psi would be fine. To be safe, though, I went up one column in the load-inflation chart, and then added 5 psi as a safety margin to account for possible unequal loads, resulting in 87 psi. All of that was unnecessary–our per-tire loads are so far under the ratings that the minimum pressure would be fine. Nevertheless, and to avoid worrying about losing 1 or 2 psi, we’re keeping it at 87 psi. And we’ve set the TireMinder to alert us if the pressure drops below 77 psi. How’s that for belt and suspenders? So, the bottom line, would we do this again? I know we’re going to do one more (the Good Sam rally in Daytona in November). There are a couple seminars we missed (fire safety being the most important), but most of all RVSEF will be at that rally and we want to take the hands-on driving course. Oh, and Wendy want to go to the Reba McIntyre and Katharine McPhee concerts. After that, I don’t know. Maybe. If the convention were held someplace we wanted to go anyway, it might be OK to go by for a few days of shopping and gawking. Maybe if we needed a bunch of accessories or had to make some major purchases, yes. Maybe if we needed some work done where vendors and installers would be known to congregate, yes. But, I really can’t see myself becoming a real rally fan. Of course, 20 years ago, I couldn’t see myself owning a motorhome. So, I guess, time will tell. Never say never. 30 August: We’re out of here and uh-oh! 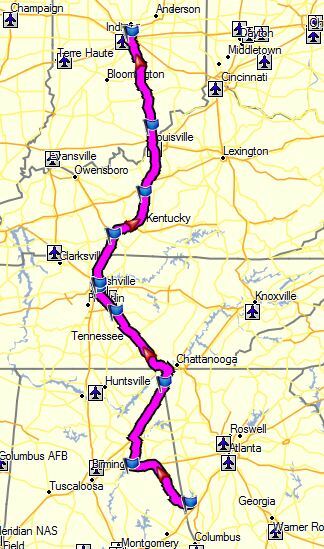 The drive back to LaGrange should have been uneventful: head out after getting weighed, beat feet down to the KOA at Manchester, TN (363 miles, long but leaving only a quick drive home the next day), and call call it a wrap! We made our first stop at the Love’s Truck Stop at Horse Cave, KY (exit 58). Wendy went into the store, I got out to gas up, and both of us left everything (including keys) in the coach. When I went back to enter the motorhome, the door handle seemed unusually hard to open (it was always a little sticky–that should have been a clue), and then WHAM!–the handle sprang outwards, a small white plastic part went flying across the parking lot, and the door was thoroughly and stubbornly positioned in the closed position. The door handle would flop freely, but had no effect, and the door would not budge. All of the windows were closed and locked. We were now completely and totally locked out. At this point, I recalled just reading a post on the FMCA forum about similar occurrences. One guy posted that the broken lock left his wife locked inside the motorhome with no way to get out. One post reported being locked inside his RV and had to climb in and out through a window. The originator of the post wondered whether the obvious dangers of a defective door handle were sufficient to prompt a NHTSA recall. So, I began to consider my options. Fortunately, there no grandchildren or dogs inside the coach, and we had a travel store, Subway, and McDonalds within a few feet. I remembered the old Boy Scout adage that, when you find yourself hopelessly lost, sit down and have a candy bar, the point being not so much the renourishment it provides, but to force yourself to remain calm and avoid any panic-driven stupidity. So we ordered a Subway sandwich, sat down for lunch, and started a methodical solution process. First, I called the Good Sam club roadside assistance. After all, we paid a flippin’ fortune for the service, and this can’t be the first time anything like this has happened. Surely, this is routine and we’ll soon be on our way. The good news is that the Good Sam agent I spoke to was very nice, and genuinely wanted to help. The bad news is that I kept getting the feeling that she didn’t know what a motorhome was, or at least how a motorhome door handle worked. She kept acting as if the problem was that I had locked my keys inside the coach and the solution was to find a local locksmith who would run over and unlock the door. I explained several times the exact nature of the problem, suggested that an ordinary locksmith might not have the right skill set for a motorhome door, but then signed off with the assurance she’d call back as soon as she had a solution in hand. Second, not having real good feelings about the prospects of success through Good Sam, I called the Camping World located about 30 miles down the road in Bowling Green. The service manager there was very helpful, even going so far as to pull a door handle unit out of parts and discuss with me how the unit worked, what the failure indicated, and what my options were. His conclusion: I was definitely screwed. Unless I could get in through a window, there would be no easy way to get in except to drill out something, somewhere on the handle, to get the door open. So, third, I called the Thor technical assistance line. 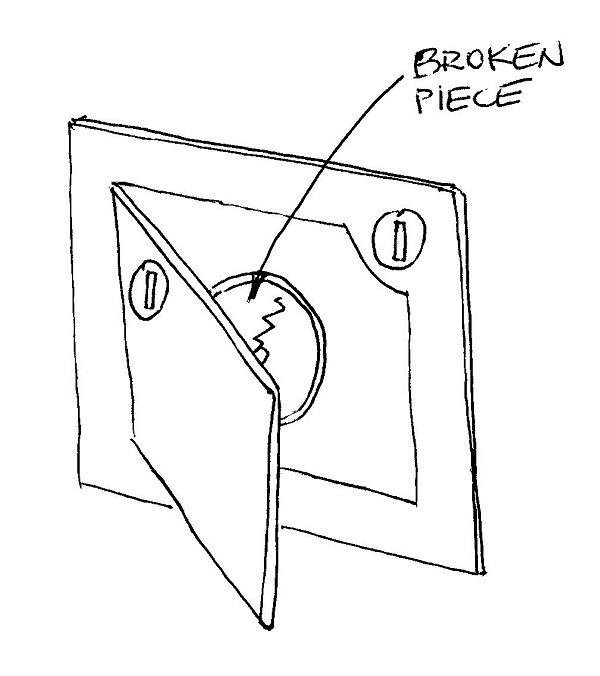 Perhaps they had encountered this problem before and knew of a fix. No such luck. Again, the guy I spoke to was very nice and wanted to be helpful, but the verdict was the same. Unless I could somehow retract the latch, the only solution would be to drill out something in the door handle assembly. Now, about 2 hours into the process, I got a call back from Good Sam: they had located a local wrecker service that also provided locksmith services, and they would be onsite within 20 minutes. I still had doubts about the whole locksmith concept, but even if he couldn’t do anything for us, I’d be no worse off than I was, so what the heck? A few minutes later, the wrecker showed up and, ta da!, he said he had no idea what to do. He thought he was looking for a Ford pickup (we had told Good Sam the motorhome chassis was made by Ford) with its keys locked inside. There was nothing he could do for us. Bottom line: A number of conclusions come to mind. On the downside, this is a pretty serious defect. Had there been people or dogs inside the coach, it could have been life-threatening, and I would have borrowed a sledge hammer and broken the door, a window, or whatever to get inside. Had there been a fire and we had been trapped inside (like one of the reported incidents), the consequences could have been fatal. Good Sam roadside service was pretty much worthless. We got charged $75 for the service call (don’t worry–I’ll get a refund one way or another) that was ill-suited to the problem at hand. Perhaps Good Sam is good for a flat tire, but I’m not convinced the telephone agents know much about RVs. Oh, and we eventually made it to the KOA in Manchester, set up for the night, and enjoyed this trip’s last dinner on the road. After the adventure of yesterday’s broken door, today was, as expected, uneventful. We did, however, discover a new joy: non-preplanned journeys down back roads. Basically, we were weary of the poor quality of the Alabama roads, just entering yet another interminable construction zone, and we decided to take a flier and take back roads all the way home. Wendy pulled out the Rand-McNally Trucker’s Atlas, and started picking our way south following truck roads designated with either a thin red line, a thicker red line, or double-red lines. What a pleasure! Definitely the way to travel and probably not significantly slower (except for where a major US Highway (like US-431) goes through a major city (like Anniston)), which is where the road turns into everything that’s ugly about traveling: traffic, stop lights, strip malls, and fast food joints. A small price to pay. Mileage went way down fighting a pretty strong headwind all the way home: 7.78 mpg over the 244.5 miles we traveled. This entry was posted in FMCA, Uncategorized on August 26, 2012 by skiprd. obviously the first RV she’d ever seen designed by a woman. Enough said. until after our first trip), but we discovered that we’re getting old. that it provided that was an essential factor. The size factor is worth saying more about. 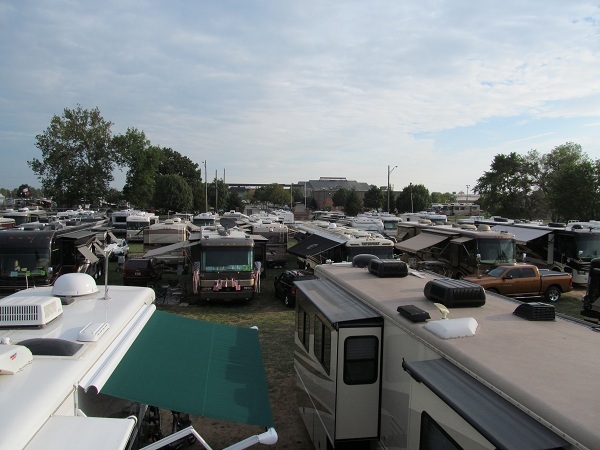 We’re not big fans of “RV Campgrounds,” at least in the sense of full hook-up, check-and-jowl, parking lots. We’d much rather be out in the woods. 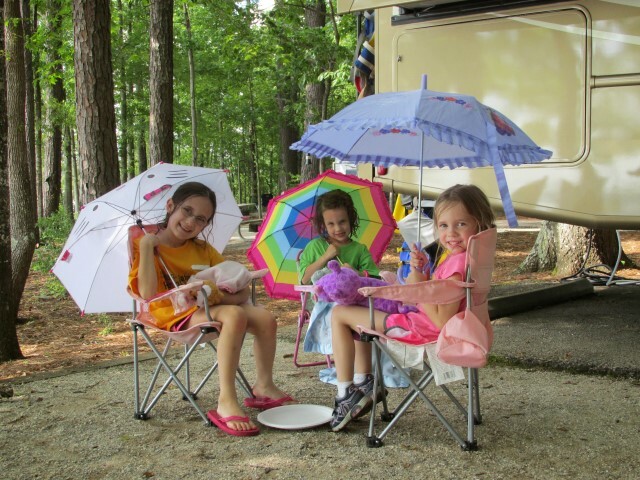 But many of the best campgrounds have campsites that have surprisingly small size limits. In Rocky Mountain National Park, some of the campgrounds have a size limit as small as 30 feet. In Yosemite, with only a few exceptions, the size limit is 35 feet. Things get even more restricted in National Forests. In Sequoia National Forest, for example, many campgrounds have size limits as small as 20 feet and only a few can accommodate rigs as big as 45 feet. Thirty feet seems to be the limit if one wants a fair selection. Ditto Corps campgrounds. Ditto state parks. Someone once said that the rule is: “Get the smallest unit you can comfortably stay in for the longest time you expect to be gone.” That sounds right to me. This entry was posted in Uncategorized on June 2, 2012 by skiprd.